We all know about the dangers of EMF radiation from cell phones. I mean this is common knowledge in the alternative health industry isn’t it? There are even some pretty amazing products that help to mitigate the damage caused from this type of radiation. But who would have thought that the light being emmited from them is perhaps even more harmful? Today Dr. Richard Hansler from http://www.lowbluelights.com joined us to discuss exactly how this harmful blue light is affecting us. For those that don’t know Dr. Jack Kruse (a neuro surgeon) told us (see link in the show notes below) that blue light is the #1 most harmful thing facing our society today in terms of how it damages our health. Dr. Kruse listed the over exposure to blue light as being more harmful than GMO foods, vaccinations, chemtrails, chemical exposure and pharmaceutical medications. I thought what he said was nothing short of fascinating. So as a result we wanted to get to the bottom of this issue and find out what’s really going on. Is blue light really that harmful? Dr. Hansler really gave us a lot of insight into exactly why blue light is do detrimental to our health. According to Dr. Hansler the blue light prevents the production of melatonin. Melatonin has been shown to be a very powerful cancer fighter. Without enough melatonin the body can’t fight off diseases like cancer, depression and many others. On top of this you have a hard time sleeping and suffer a host of other health problems as a result of insomnia. A lack of melatonin also prevents us from being able to lose weight. You’ll never see blue light being talked about as the culprit on the Celebrity Fit Club will you? Apparently the blue light spectrum enters into the retna and into the pineal gland. This blue light somehow prevents the pineal gland from creating melatonin. On top of all this if you’re drinking fluoridated water, your pineal gland is probably over calcified and much smaller in size. Your pineal gland is the center of your awareness. It’s the center of your intuition and it causes you to be spiritually more aware and awake. If you know of anybody that uses computers, owns a cell phone or tablet, please like and share this page with them if you can! Dr. Hansler spent 42 years as a senior scientist at the world-renowned GE Nela Park lighting laboratory, where he was instrumental in the development of several lighting techniques and applications. Shortly after retiring in 1996, he formed the Lighting Innovations Corporation, where he has drawn on his vast technical knowledge and wide industry contacts to continue to push the boundaries of lighting technology. Since its inception, the Corporation has received well over $1 million in funding from such federal agencies as the Federal Aviation Administration and NASA, and additional support from private industry. Dr. Hansler holds a doctorate in physics from Ohio State University, and is an adjunct physics professor at John Carroll University. 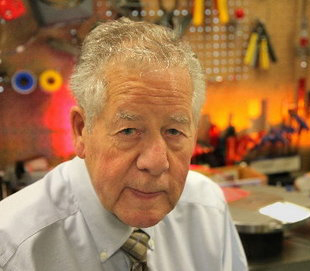 His work has won 86 U.S. patents, with more currently pending approval. He occasionally serves as an expert witness in legal cases that center on his technical specialty.